Baghdad/Muthenna was an Iraqi military facility west of the center of Baghdad. It consisted of one 3,000 m asphalt/concrete runway sited in a developed industrial/residential area. It was the home base for Iraqi Air Force transport squadrons and navigation school. During the 1991 Gulf War, three of Baghdad's 42 targets -- Iraqi air force headquarters, Muthenna airfield, and Ba'ath party headquarters -- absorbed 20 percent of the effort. The Ba'ath party headquarters were hit with 28 bombs, Iraqi air force headquarters 17, and Muthenna airfield with 25. The 13-story Iraqi air force headquarters building, on the southeast edge of Muthenna airfield, was shown in the first publicly unveiled air strike videotape. During the Second Gulf War Coalition forces again struck Iraqi Air Force headquarters buildings in central Baghdad, located west of the Tigris River, near the Baghdad/Muthenna airfield. Coalition aircraft struck the buildings with JDAMs. The strike degraded Iraqi Air Force capabilities to command and control Iraqi air assets. The damage at Muthenna was so extensive that it was subsquently abandoned as a functioning aviation facility. 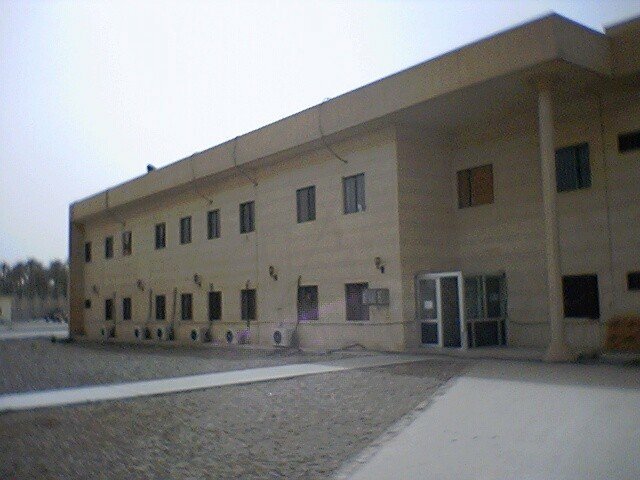 The heavily fortified Iraqi Army Recruiting Station at Muthenna airport was hit by a car bomb on 11 February 2004, when up to 47 people died. A sedan carrying explosives drove to the front of the recruiting station where numerous Iraqis were waiting in line to enlist in the Iraqi Army. Soldiers from Task Force 1st Armored Division's 4th Battalion, 27th Field Artillery Regiment provided aid to the victims and secured the blast site. The bomb was four to five hundred pounds and a mixture of C4 explosive and artillery shells. The vehicle carrying the bomb was completely destroyed. Rush hour traffic and a large crowd of people were on the street when the blast occurred, and a group of men angrily shouted at American soldiers wanting to know how this could have happened. In another car bomb attack at the Iraqi Army recruiting center on 17 June 2004 at least 25 people were killed. The car, packed with shells, blew up at at the gates of the center. The car drove into a crowd of about 100 queuing volunteers before exploding. Debris was scattered along a four-lane highway and at least one artillery shell could be seen lying on the blood-stained road. In July of 2005 the reforming Iraqi air force received three C-130E transports from the US government. The aircraft are to be used by the Iraqi air force's re-activated 23 Sqn at the Muthenna airbase. 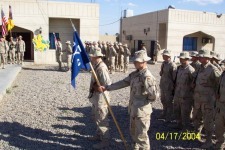 In mid-September 2004, as part of an Army-wide effort to give its facilities around Baghdad friendlier connotations, Camp Headhunter was renamed Camp Independence, with its Arabic translation "Camp Al-Istiqlal". Camp Independence is approximately a mile away from Haifa Street and the neightborhood formerly known as Saddamiya. TF 1-9 CAV worked hard to improve living conditions. They made significant improvements on the base and improvements have continued. All soldiers are now living inside buildings, and have access to running water (not always hot), porta-potties, and electricity. All have access to the Internet, although some may have to pay a small charge ($2/hour) for use. Phones are a problem. Soldiers have limited access to a PX trailer where they can purchase small items using cash, check or debit/credit cards. They can receive cash back if they use a debit card. Soldiers also have limited access to Finance where they can cash checks or get casual pay. They also have laundry services and a barber. A comprehensive distribution of back pay for Iraqi government workers took place in the Karkh neighborhood in central Baghdad. The workers of various government ministries were compensated for five payless months. More than 8,000 workers were approved for one of three stipends, based on their normal level of pay. The mass distribution ran from April 18 through April 22, 2004, with each ministry designated a different time for the pay delivery to help keep the event under control. Iraqi Civil Defense Corps (ICDC) and Task Force Baghdad Soldiers ensured that the several billion Iraqi dinar would be distributed in an orderly manner. Concertina wire directed employees to areas where they were searched, checked off a payroll list and sent to the location where they received their cash. The concrete walls of Forward Operating Base (FOB) Headhunter protected the site from the surrounding neighborhood. With FOB Headhunter's barracks filled to the gills, the former 1st Armored Division's break rooms and broom closets became 1st Cavalry Division Soldiers' living quarters. The First Team Soldiers had no room to have a spot to get out of the sun and kick back, until 1st Battalion, 9th Cavalry Regiment Command Sgt. Major Donald Felt stepped up to the plate. "The previous unit that was assigned to this FOB started a contract to build an MWR building, the preface of which was to have half as a gymnasium and half of it as a restaurant," Felt said. 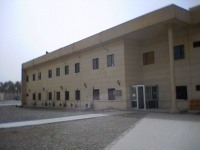 "We moved into the FOB on the 2nd of April [and] the building was just finished, but the gymnasium and the restaurant were not finished at that time. So we continued that process so we could open up a facility for the Soldiers to visit and get a meal other than the mess hall." That initial idea turned into what is now a restaurant called Planet Headhunter, an Iraqi-run burger and pizza joint with a calm, café-like ambiance. A patio is also being added for those who would like to have a smoke with their meal. On the grand opening, May 5, Soldiers were fed free food from the FOB's new cafe. "Basically, it's an Iraqi business operating here on the FOB," Felt said. "It's going to open at ten in the morning and close at nine at night which is helpful because we only have lunch served on the FOB three days a week. The other days Soldiers eat MREs [meals ready-to-eat]. Of course, that isn't very popular, so having an alternate selection for them is a good thing." The idea of having half of the building as a gym worked out, as the equipment they previously had was moved. "The previous unit had a gym in a tent, so we moved the equipment into the building. We purchased some additional equipment such as a treadmill, stair climber and bicycles. "In the process of doing that, we noticed that the gym was very big and decided to put in a wall and further partition the building so that we could open a bar. Of course, a near-beer bar," he added with a chuckle. "It gives a Soldier somewhere to go and for a moment, at least, step out of Baghdad. Our intent was to have this remind them of home," he said. "The camaraderie that develops from them being able to relax, sit around a table, throw back a near-beer and talk about things, that's what's important." Felt is also leading a spirited campaign to try and convince country music megastar Toby Keith to visit FOB Headhunter and play a few songs for the troops. "Right now the bar is called 'Toby's Favorite Bar,'" Felt said proudly. "We've named the bar after Toby Keith because we appreciate the patriotism of the songs Toby Keith has sung in the last few years." Some guitars, a drum kit and somebody to blare out vocals is all it took for five members of this coalition base camp to get things started. What they started was their band, called Headhunter Main. "Not only is it a morale booster for us to play, it's a morale booster for everyone on the FOB," said Spc. Travis Conway, from headquarters company, 1st Battalion, 9th Cavalry Regiment. The band started up in May 2004 and prepared for their first concert in Baghdad. They played for the Soldiers on FOB Headhunter for their 4th of July party outside 'Toby's Favorite Bar' at 8:30 p.m.
Anti-Iraqi forces have continued to engage Iraqi National Guardsmen as they work to maintain security on the streets of Baghdad. 1st Cavalry Division Soldiers are finding themselves in a supporting role in many of these firefights, and on one such occasion, the Soldiers lived up to the creed to never leave behind a fallen comrade. During an August 15 "thunder run," or mounted patrol Soldiers of Company A, 1st Battalion, 9th Cavalry were engaged by rocket-propelled grenade and small-arms fire. They were patrolling in the vicinity of Talil Square, a well-known hotbed of anti-Iraqi insurgency. Moving into an attack-by-fire position, the company's Bradley Armored Fighting Vehicles dropped their troop ramps to engage the enemy. 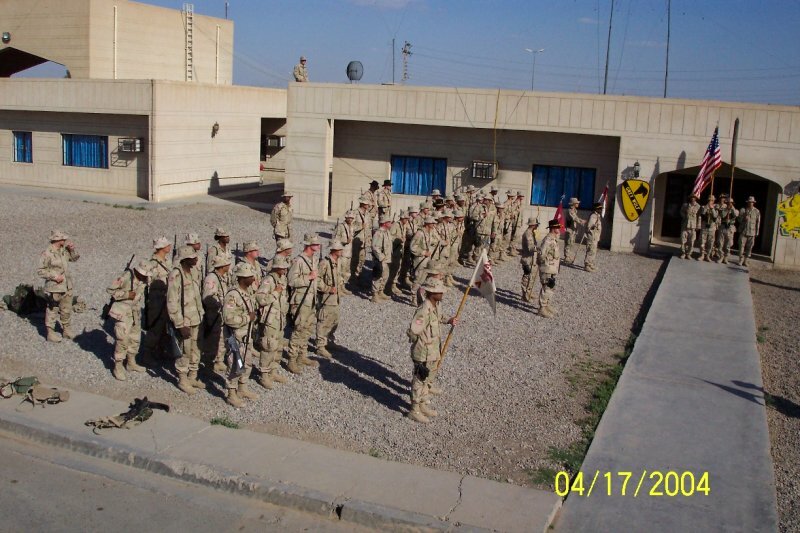 The thunderous sound of the Bradleys, unknown to the men of Company A at the time, had distracted a group of insurgents enough to allow an Iraqi Army Soldier who had been recently captured to escape from a building in the vicinity of Talil Square. After the Iraqi Soldier was recovered, the patrol received word that ten more Iraqi National Guard Soldiers were pinned down just outside Talil Square. The Soldiers quickly planned an effort to relieve the pressure, and moved into position. After a five-minute firefight with an unknown number of insurgents, the patrol moved back to FOB Headhunter, only to be called back out to retrieve the body of a dead Iraqi National Guardsman they had noticed in the middle of Haifa Street during their engagements a few hours earlier. Civil affairs teams supporting the 3rd Battalion, 8th Cavalry Regiment and 1st Battalion, 9th Cavalry Regiment, of the 3rd Brigade Combat Team, 1st Cavalry Division, conducted basic weapons training and a live-fire range for 26 Iraqi police officers from the Al Karkh patrol sector, at Camp Independence in December 2004. Soldiers at Camp Independence do a great deal of training of Iraqi police and soldiers. These Iraqis live on the airfield in a collection of hangers in very close and uncomfortable quarters.